Cash those Coupon Codes in that you earned in August because they expire at the end of September. That’s right if you earned Bonus Days coupons by purchasing from me in August, you received a $5 coupon code for every $50 spent. Believe me, there is plenty to spend them on this month with the Holiday Catalog release. What? You don’t have any coupon codes! Well, don’t despair… the first 10 people (only available to residents in the USA) to leave a comment on this post and then EMAIL me their $50.00 order along with contact information within 24 HOURS (before shipping & tax) will receive a coupon code to be applied to their order immediately! This offer is available only until Tuesday, September 11, 2018! Use Your Bonus Days Coupons! The Bonus Days redemption has started and I bet you can’t wait to get that free product in your hands. I also have so much to share this month as I organize and get some samples and projects ready to post. 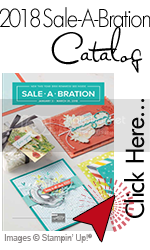 The Holiday catalog is chock full of great stamp sets and accessories.